31.99 from Woodies, 21.51 from Heiton Buckley. Wow, that’s a big difference. I’d been meaning for ages to purchase something to measure power consumption in the house. Earlier this week, a work colleague reminded me about it, so I went and purchased one. My Current Cost Envi arrived just before 8am this morning (thanks Mr. Postman) so I hurriedly plugged it all in before going to work. This evening after dinner I found the data cable and plugged it all in. Excellent, the device was recognised to begin with. I found this web page by Paul Mutton, describing how to generate graphs from it with RRDtool. Some minor modifications, courtsey of “Q” and we have a result. I may not be as useless as I thought. From Paul Watson. I might be able to make it to the 17th or even 19th Century (8/10). Unlikely, but a bit of fun nonetheless. Excellent video from Henk, PA3GUO showing Amateur Radio’s involvement in the experiment. I’m not long back from the DCC, and I thought I would comment on it while the memory is still fresh. I had never been before, so I was wondering what I had let myself in for. Well I have to say I had a blast. From my accidental meeting of Larry WR1B on the shuttle to the hotel, to having lunch with the TAPR folks just before I caught my flight home, the atmosphere at the event was all about the sharing of knowledge. Like all good events, most of the really good discussion goes on in the corridors between presentations. Over breakfast, lunch, or indeed in the demo room. Coolest presentation for me was the HPSDR, Modular Software Defined Radio, and the sheer enthusiasm of the guys was infectious (I want one!). The picture below shows the set-up (belonging to N8ZM I think) for the tutorial on Sunday morning. 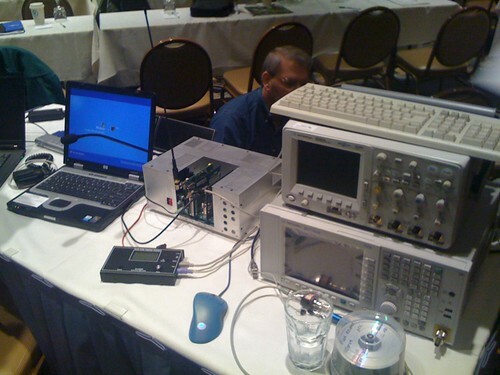 The intention was to monitor the transmitted waveform from the transmit side on the spectrum analyser (large box to the right of picture) and also to receive and decode transmitted signals from Larry WR1B’s recently constructed NEU-PSK (small flat black box). All great fun. I may not make it next year, or indeed the year after, but I will make it back.